A timestamp is something you use when you want to track activities. For example, you may want to track activities such as when was a particular expense incurred, what time did the sale invoice was created, when was the data entry done in a cell, when was the report last updated, etc. If you have to insert the date and timestamp in few cells in Excel, doing it manually could be faster and more efficient. Control + : (hold the control key and press the colon key). Select the cell where you want to insert the timestamp. This would instantly insert the current date in the cell. This shortcut would only insert the current date and not the time. It comes in handy when you want to selectively enter current date. It picks the current date from your system’s clock. 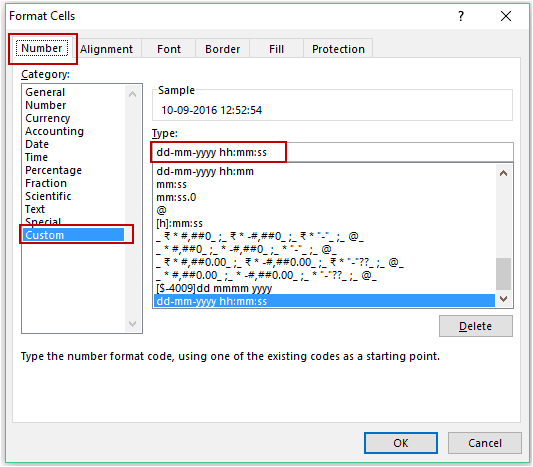 Once you have the date in the cell, you can apply any date format to it. Simply go to the ‘Number Format’ drop-down in the ribbon and select the date format you want. Note that this is not dynamic, which means that it will not refresh and change the next time you open the workbook. Once inserted, it remains as a static value in the cell. This would instantly insert the current time in the cell. So if you want to have both date and timestamp, you can use two different cells, one for date and one for the timestamp. In the above method using shortcuts, the date and timestamp inserted are static values and don’t update with the change in date and time. 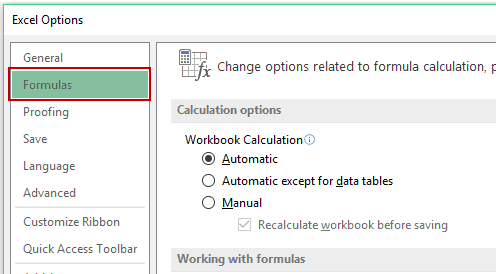 If you want to update the current date and time every time a change is done in the workbook, you need to use Excel functions. This could be the case when you have a report and you want the printed copy to reflect the last update time. To insert the current date, simply enter =TODAY() in the cell where you want it. Since all the dates and times are stored as numbers in Excel, make sure that the cell is formatted to display the result of the TODAY function in the date format. Right-click on the cell and select ‘Format cells’. 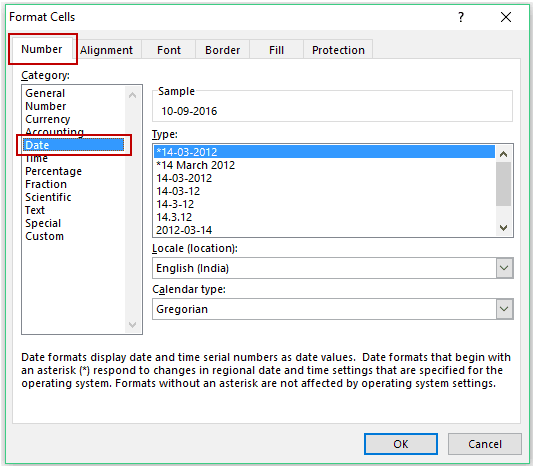 In the Format Cells dialog box, select Date category in the Number tab. Select the required date format (or you can simply go with the default one). Note that this formula is volatile and would recalculate every time there is a change in the workbook. If you want the date and timestamp together in a cell, you can use the NOW function. 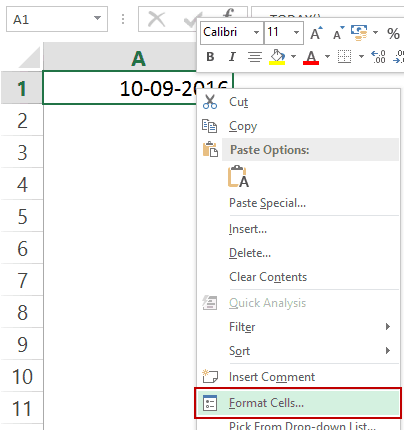 Again, since all the dates and time are stored as numbers in Excel, it is important to make sure that the cell is formatted to have the result of the NOW function displayed in the format that shows date as well as time. In the Format Cells dialog box, select ‘Custom’ category in the Number tab. This would ensure that the result shows the date as well as the time. One of my readers Jim Meyer reached out to me with the below query. This can be done using the keyboard shortcuts (as shown above in the tutorial). However, it is not automatic. With shortcuts, you’ll have to manually insert the date and timestamp in Excel. To automatically insert the timestamp, there is a smart technique using circular references (thanks to Chandoo for this wonderful technique). Let’s first understand what a circular reference means in Excel. Suppose you have a value 1 in cell A1 and 2 in cell A2. This happens as you are using the cell reference A3 in the calculation that is happening in A3. Now, when circular reference error happens, there is a non-ending loop that starts and would have led to a stalled Excel program. But the smart folks in Excel development team made sure that when a circular reference is found, it is not calculated and the non-ending loop disaster is averted. However, there is a mechanism where we can force Excel to at least try for a given number of times before giving up. Now let’s see how we can use this to automatically get a date and timestamp in Excel (as shown below). Note that as soon as I enter something in cells in column A, a timestamp appears in the adjacent cell in column B. However, if I change a value anywhere else, nothing happens. Go to File –> Options. In the Excel Options dialog box, select Formulas. Now when you enter anything in column A, a time stamp would automatically appear in column B in the cell adjacent to it. With the above formula, once the timestamp is inserted, it doesn’t update when you change the contents of the adjacent cell. This formula uses the CELL function to get the reference of the last edited cell, and if it’s the same as the one to the left of it, it updates the timestamp. Note: When you enable iterative calculations in workbook once, it will be active until you turn it off. To turn it off, you need to go to Excel Options and uncheck the ‘Enable iterative calculation’ option. If VBA is your weapon of choice, you’ll find it to be a handy way to insert a timestamp in Excel. VBA gives you a lot of flexibility in assigning conditions in which you want the timestamp to appear. Below is a code which will insert a timestamp in column B whenever there is any entry/change in the cells in Column A. This code uses the IF Then construct to check whether the cell that is being edited is in column A. If this is the case, then it inserts the timestamp in the adjacent cell in column B. Note that this code would overwrite any existing contents of the cells in column B. If you want. You can modify the code to add a message box to show a prompt in case there is any existing content. This code needs to be entered as the worksheet change event so that it gets triggered whenever there is a change. 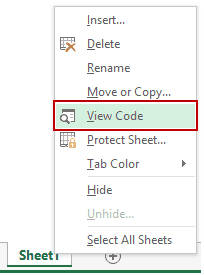 Right-click on the worksheet tab and select View Code (or use the keyboard shortcut Alt + F11 and then double click on the sheet name in the project explorer). Copy paste this code into the code window for the sheet. Make sure you save the file with .XLS or .XLSM extension as it contains a macro. Creating a custom function is a really smart way of inserting a timestamp in Excel. 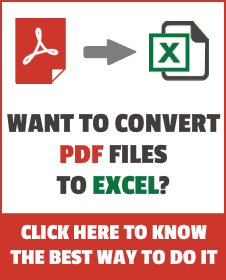 It combines the power of VBA with functions, and you can use it like any other worksheet function. This code needs to be placed in a module in the VB Editor. Once you do that, the Timestamp function becomes available in the worksheet (just like any other regular function). Press ALT + F11 from your keyboard. It will open the VB Editor. 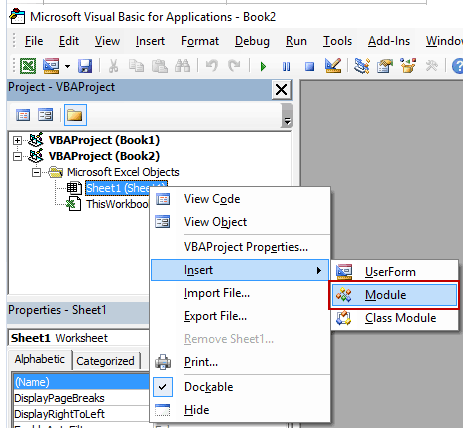 In the Project Explorer in VB Editor, right-click on any of the objects and go to Insert –> Module. This will insert a new module. Copy paste the above code in the module code window. Close the VB Editor or press ALT + F11 again to go back to the worksheet. Now you can use the function in the worksheet. It will evaluate the cell to its left and insert the timestamp accordingly. It also updates the timestamp whenever the entry is updated. Make sure you save the file with .XLS or .XLSM extension as it contains VB code. Hope you’ve found this tutorial useful. 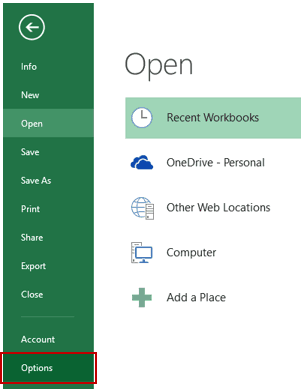 How to Create and Use an Excel Add-ins. Select Multiple Items from a Drop Down List in Excel. Inserting Date and Timestamp in Google Sheets. When all the relevant data is entered then I get ” found-clear” in column O & now all the data related to that entry is to be extracted to another book, say BOOK-2. Also extracted data should appear in BOOK-2 in a sequential manner, without blank rows & as any entry is cleared in BOOK-1(PO entry workbook), it should appear in BOOK-2 below all the previously extracted entries. 1) Fixed, non-volatile timestamps as soon as ” found-clear” appears in column O for any PO entry. 2) To give Rank to these timestamps, using Rank Function. 3) Then use Index, Match, Rows to extract data in a sequential sorted manner. 1A) Also if I change conditions so that “found-clear” is removed & then recreate the conditions to get “found-clear” back, timestamp disappears. 2A) It is showing the year as 1989 in place of 2019. 2B) If I make any changes to the worksheet, like add or remove cells anywhere in the worksheet, all the timestamps change to current time & date. 2C) Rank function not working. I have a different requirement and this is for stock market. Let me know if the above explanation helps. For e.g. a BUY or SELL that came at say 11:15 AM, should remain static unless the signal changes from a buy to sell or a sell to buy, but everytime my excel refreshes it updates with the current time in this column. What I am looking for is to understand what time a buy or sell came. I used this formula yesterday on 5th March and it worked perfect =IF(A2″”,IF(B2″”,B2,NOW()),””) my dates registered as 5th March timestamp. However I’ve now come into the same spreadsheet the very next day on 6th March but when i enter data into column A new rows, the formula in column B remains blank no result. Is there another step I’ve missed so it recognises a new day? This has been really helpful! thank you! I was wondering if we’re able to input in multiple cells (e.g. A2, B2, D2) and still get and updated timestamp in “F2” when ever the multiple cells (A2, B2, D2) are updated. It worked on one Excel Spreadsheet but when I tried it again on another Spreadsheet (totally different workbook), it just shows a blank cell. I have it formatted for date. In the example, “Using VBA to Automatically Insert Timestamp in Excel” I have a condition where a process is running and I want to ‘time stamp’ when it began in one column and ‘time stamp’ (date and time) when the process ended, a few columns to the right…meaning a start and stop time stamp. Can this formula accommodate this requirement? 1. Choose one Reference Cell, e.g. [A1]. It can be on a separate worksheet. The target cell can be formatted according to your preferences, e.g. “YYYY-MM-DD” or “hh:mm:ss”. The advantage is that you can also catch the seconds which is not possible with the keyboard shortcut [CTRL] + [SHIFT] + [:]. 4. You can also incorporate this in any formulas you are using in your worksheet. Every time you enter the word “ok” in Row [C], Row [B] will automatically register the current time. To do this format Row [B] as “hh:mm:ss”. Then you copy this formula to the range you will be using. Now, every time you enter “ok” in a cell on Row [C], you will get an automatic (and static) time stamp in the adjacent cell in Row [B]. I’m trying to create a timestamp based on a dropdown value, however leveraging the macro is providing a validation error. Is there a workaround? If I use in a blank (no validation field) the vba/macro works correctly. replace -yyy by -yyyy (4 letters) and it will work. Hi there – this is FABULOUS! Really saved me a lot of pain! Can you assist with one thing? I need to be able to create the timestamp, on a separate row, each time a (custom function) button is pressed? We will be using this to create a basic “footfall counter” to count the time/date and number of people passing into our IT support area. Is it possible to write a code that take effect of Cell A or Cell B for the timestamp? This is just what I needed. You rock! But whenever i type in other cells, the time updated. or when i save and close, then reopen the date and time updated automatically. Can the custom function be modified to display hh:mm then am or pm? Wowww This is what I am looking for!!! That solves the problem and the formula works fine every time. Why =IF($A$1″”,NOW()) does not work here. grate! just you should say that it works mailny or totaly only on ENG versions. I have checked ‘enable iterative calculation’ option and I have put the formula =IF(A2””,IF(B2””,B2,NOW()),””) in cell B2 but I am getting error #Name? when I enter any text in A2. Hello Sajid.. Your double quotes are not in the right format (it happens sometimes when copied directly from the webpage). Just delete the double quotes and enter it manually. It would work then. Yes, Now it’s working. Thank you so much Sumit. I like the automated timestamp, I have users who have asked for similar things, it gives ideas on how to implement. Thanks Sumit……..I was searching this for more over decade. Glad you found this useful Anand! When I tried to use the formulas to insert the timestamp, it returned 1/0/1900. It sounds like some setting that needs to changed but I couldn’t figure out where or what to change.